Aftermarket demand for automotive brake parts in North America will rise 2.6% annually to $4.3 billion in 2021. The US will still account for nearly four-fifths of all brake part sales gains in value terms, based on its large and aging light vehicle park, though Mexico will pose the fastest growth. Shoes, pads and linings will register the biggest gains in value terms. A trend away from the installation of brake drums by OEMs will lead to a shift in the product mix, hurting demand for brake shoes and drums. 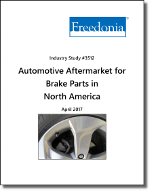 This Freedonia industry study assesses the North American automotive brakes aftermarket, offering historical demand data plus forecasts for 2021 by country (US, Canada, Mexico), product (shoes, pads and linings; rotors, cylinders and calipers, drums, ABS-related parts, other) and performer (professional, consumer/DIY). In addition, the study evaluates company market share and analyzes on industry participants including Akebono Brake Industry, Brake Parts, Brembo, CARDONE Industries, Continental, CWD, Centric Parts, Federal-Mogul, MAT Holdings, and Power Stop.